Daniel Hemric (0 Wins, 374 Points, +305 Points Ahead of 31st) - Would clinch on Points with 10 Points (23rd and no laps led, 24th and led at least one lap, 25th and led most laps) and a new winner. Would clinch on Points with a repeat winner, regardless of finish. 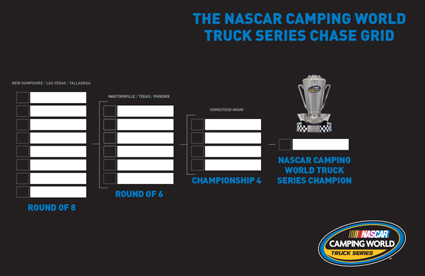 With a win, they would clinch a Chase spot on wins. Timothy Peters (0 Wins, 350 Points, +281 Points Ahead of 31st) - Would clinch on Points with a repeat winner (or a win by Daniel Hemric) and 2 Points (31st and no laps led, 32nd and led at least one lap). With a win, he would clinch a Chase spot on wins. Could clinch on Points with a new winner and help (needs to outpoint Daniel Hemric by 6 points (Peters owns the tie-breaker). 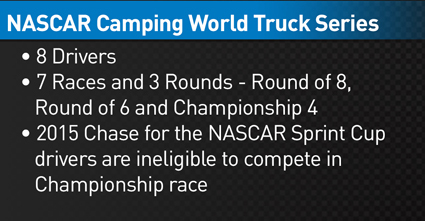 Cole Custer (0 Wins, 318 Points, +249 Points Ahead of 31st) - With a win, he would clinch a Chase spot on wins. 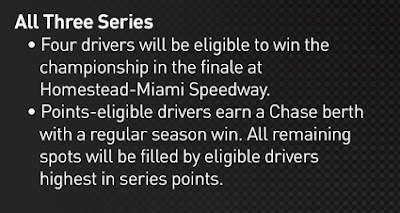 Could clinch on Points with a repeat winner (or win by Daniel Hemric) and help (needs to outpoint Timothy Peters by 32 points (Custer owns the tie-breaker)).